You can find on this page detailed information on how to remove Queens Tales 2- Sins of the Past Collectors Edition for Windows. It was created for Windows by Game Owl. You can find out more on Game Owl or check for application updates here. Please open http://game-owl.com if you want to read more on Queens Tales 2- Sins of the Past Collectors Edition on Game Owl's page. Queens Tales 2- Sins of the Past Collectors Edition is commonly set up in the C:\Program Files (x86)\Queens Tales 2- Sins of the Past Collectors Edition folder, but this location can vary a lot depending on the user's choice while installing the application. C:\Program Files (x86)\Queens Tales 2- Sins of the Past Collectors Edition\uninstall.exe is the full command line if you want to uninstall Queens Tales 2- Sins of the Past Collectors Edition. The program's main executable file is called QueensTales2_SotP_CE.exe and it has a size of 5.98 MB (6266368 bytes). The executable files below are installed along with Queens Tales 2- Sins of the Past Collectors Edition. They occupy about 7.30 MB (7654912 bytes) on disk. This web page is about Queens Tales 2- Sins of the Past Collectors Edition version 2 alone. Queens Tales 2- Sins of the Past Collectors Edition has the habit of leaving behind some leftovers. 1. If you don't have Advanced Uninstaller PRO already installed on your system, add it. This is good because Advanced Uninstaller PRO is the best uninstaller and general tool to optimize your PC. 2. Run Advanced Uninstaller PRO. Take some time to admire Advanced Uninstaller PRO's design and number of features available. Advanced Uninstaller PRO is a very useful system optimizer. Safety rating (in the left lower corner). This explains the opinion other users have about Queens Tales 2- Sins of the Past Collectors Edition, ranging from "Highly recommended" to "Very dangerous". 7. Press the Uninstall button. A confirmation window will show up. accept the removal by pressing Uninstall. 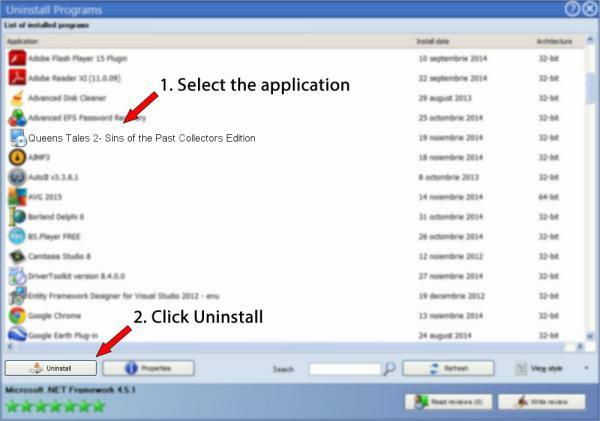 Advanced Uninstaller PRO will remove Queens Tales 2- Sins of the Past Collectors Edition. 8. After removing Queens Tales 2- Sins of the Past Collectors Edition, Advanced Uninstaller PRO will offer to run an additional cleanup. Click Next to proceed with the cleanup. All the items that belong Queens Tales 2- Sins of the Past Collectors Edition which have been left behind will be detected and you will be asked if you want to delete them. By uninstalling Queens Tales 2- Sins of the Past Collectors Edition using Advanced Uninstaller PRO, you can be sure that no Windows registry items, files or folders are left behind on your computer. This page is not a recommendation to remove Queens Tales 2- Sins of the Past Collectors Edition by Game Owl from your PC, we are not saying that Queens Tales 2- Sins of the Past Collectors Edition by Game Owl is not a good application for your PC. This text simply contains detailed info on how to remove Queens Tales 2- Sins of the Past Collectors Edition in case you want to. The information above contains registry and disk entries that our application Advanced Uninstaller PRO stumbled upon and classified as "leftovers" on other users' computers.